I have been reading a spate of stressful books lately, for no apparent reason, and unsurprisingly, they are stressing me out! The latest was Baby Teeth by Zoje Stage. It’s about a 7 year-old girl named Hanna who is terrible to her mother Suzette and angelic to her father Alex. When Baby Teeth opens, Suzette is at the end of her rope: she is homeschooling Hanna, who has been asked to leave two different schools due to extreme misbehavior, so she’s with her all day long. Hanna does not speak – to anyone – so trying to parent her is especially challenging for Suzette. 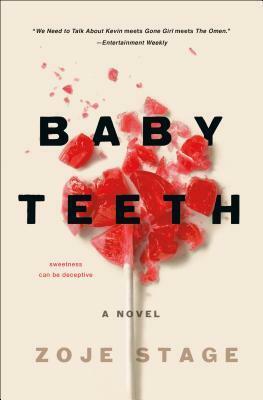 Baby Teeth is told in alternating chapters between Suzette and Hanna. We hear, from Suzette’s perspective, about her feelings of failure as a mother, her intense love for Alex, her frustration with his unwillingness to see Hanna as she does, and the cycle of guilt-anger-fear she goes through whenever she interacts with her daughter. Hanna, meanwhile, is shown to be intelligent, observant, manipulative and… deeply attached to her father. Suzette, of course, is the enemy – the one who keeps her from having her father to herself. Things go from bad to worse as Hanna becomes more and more menacing and starts threatening her mother’s physical safety. Suzette and Alex reach out for professional help, trying to get to the bottom of their daughter’s behavior and find a solution for her to go to school. Baby Teeth is a thriller, and it’s fun (? ), or at least interesting, to see what Hanna will do next and whether Suzette will get the better of her. Stage is a good writer, observant about motherhood and how it can affect a marriage – although I did find this marriage really unrealistic. So I read on, eager to hear what would happen and just a bit scared to turn the page. (Of course, you put yourself in Suzette’s shows and wonder how you would react if you had a diabolical daughter). In the end, however, I didn’t really see the point of the book beyond scaring people. I’ve heard Baby Teeth compared to We Need To Talk About Kevin, and I can kind of see that, but Kevin is the far superior book. Baby Teeth is thrilling and creepy and anxiety-inducing, but I can’t say I’m better in any way for having read it.